One of the many joys of our first year in Suffolk has been observing the profusion of plants in the garden, and the different waves of flowers throughout the seasons. We have watched the early snowdops replaced by daffodils and then bluebells, before the cherry trees started to flower. As a novice gardener, I’m gradually learning which plants we have, even if I can hardly say aquilegia let alone spell it, and had to send photos to my mother to discover “that spiky one” is supposedly mahonia japonica. 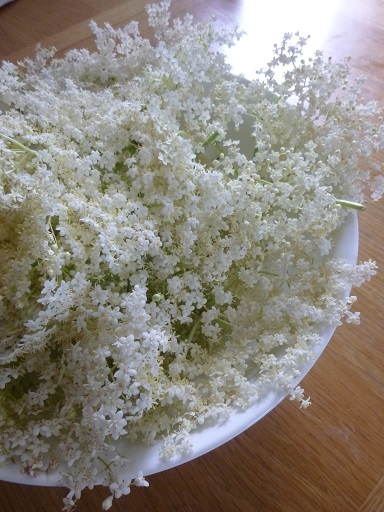 But when the elder started flowering outside the kitchen, I could definitely recognise it as a source of elderflower cordial, and decided to try making some. Luckily my mother likes cooking as well as gardening, and emailed over a pretty idiot-proof recipe, with copious annotations. The original recipe is by Sophie Grigson here. This is what happened when I had a go. 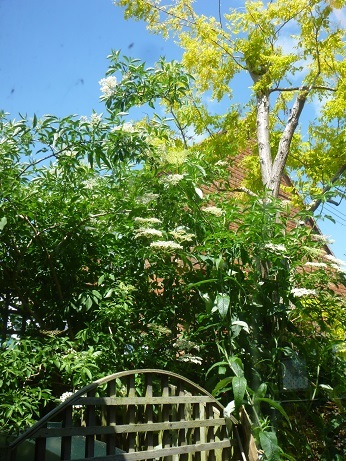 20 heads of elderflower, obtaining by hanging off a wobbly ladder and scrambling over the oil tank. 50g citric acid. Acting on my mother’s instructions, make a special trip to the local chemist to buy citric acid. Get congratulated by the Boots lady that they actually have any left, as they’d usually have run out by now. Return home and actually read the recipe, to discover I should have bought 75g not just 50g. Decided it hopefully won’t matter too much. 1.8kg caster sugar. On re-reading the recipe, register that it requires an enormous amount of sugar, not just an “of course I’ve got a bag of sugar in my store cupboard” amount. Make another shopping trip to buy an extra bag of sugar. Most of a lemon. Original recipe suggests 2 unwaxed lemons. My mother suggests a couple of slices and maybe some lemon zest “depending on how lemony you want it”. I compromise on three quarters of a lemon lurking in the fridge. 1.2 litres water. Aha – this one I can do. So pretty. Apart from the insects. 1. Shake the elderflowers to evict any lingering insects, ideally over a plate rather than over the whole kitchen. Try pinching off the really tenacious ones, and flap ineffectually with some kitchen towel at the rest. Put the flowers in a bowl. 2. Measure the water into a really big saucepan, pour in the enormous amount of sugar, and bring it all up to the boil. Stir until the sugar has dissolved. 3. Meanwhile, slice your lemon, discarding the pointy ends. 4.When the syrup is boiling, take it off the heat, then dump in the lemon, citric acid and elderflower heads and stir. Put a tea towel over the pan or put the lid on, and leave it at room temperature for 24 hours. 5. The next day, put a sieve on top of a large container, and then line the sieve with butter muslin. 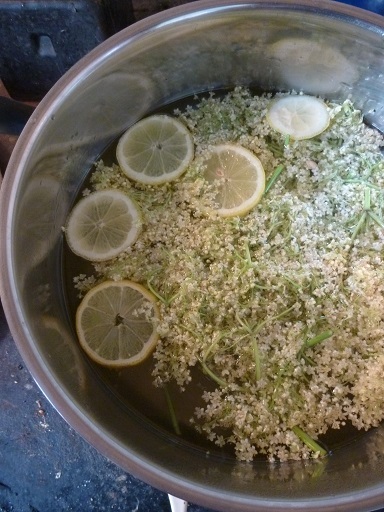 Try to avoid any temptation to strain your elderflower cordial straight down the sink. Feel smug that the butter muslin you bought to make yogurt cheese is coming in handy for another recipe. Feel glad the muslin is catching any lingering insects. 6. Pour the cordial onto the muslin, and let it drip through. You may need to keep topping up the sieve. 7. Get excited and give your husband a teaspoon of extremely concentrated elderflower cordial. Resolve to ask your mother quite how diluted it needs to be. 8. Decant the cordial into thoroughly cleaned glamorous bottles if you have them, or equally clean jam jars if not. Clean extra jars when it turns out you made more cordial than expected. Screw on the lids, put the jars in the fridge, re-read the recipe and find it says put them in a cupboard, wonder what the recipe author has against fridges. 9. Run round the house trying to find labels so no-one will mistake the cordial for sample jars before you’ve finished the seventh jar. Brace yourself for drinking elderflower cordial for the rest of your natural life. Love it, but don't make it due to the amount of sugar. Not sure about keeping in cupboard rather than fridge as I'm pretty sure it will go off fairly quickly even if it is mainly sugar. Yes the sheer volume of sugar does make me wary about drinking too much of it, even if I am diluting it one part cordial to six parts water. Makes a nice change from tea and water occasionally. It also freezes extremely well. I use well washed out plastic milk bottles, remembering, usually, to leave room for expansion on freezing. I always have success with Elderflower Cordial and completely failure with Elderflower Champagne, so I've given up making the latter. Freezing some of the cordial sounds eminently sensible, given the vast quantities I've made. You only need the citric acid if you want to keep it in a cupboard. If you freeze it like Sue does then you won't need it. I never bother with it. I freeze mine in plastic bags in pint sized quantities. I should add that my recipe has a lot of lemon juice in whereas yours doesn't so maybe leaving out the citric acid will adversely affect the flavour.